is an object that represents a runnable external process. represents the running external process with PID pid on your computer system. ProcessObject can be created by StartProcess. For processes started by StartProcess, ProcessObject can be used in place of a stream in functions like Read, Write, BinaryRead, and Import. 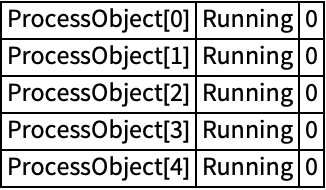 ProcessObject can represent both a running process and a process that has ended.